Columbia, Md. — Global design and BIM software developer Vectorworks, Inc. announced the English-version release of its 2018 Vectorworks software. The release includes Vectorworks Architect, Landmark, Spotlight, Designer and Fundamentals, as well as Vision. New this year is Braceworks, a structural load analysis add-on module targeted to designers and riggers working on temporary entertainment structures. This release is the first in the 2018 worldwide rollout, which will include the release of 10 additional localized-language versions. Multiple drawing views — Use multiple views of a project simultaneously, and begin work in one view pane and finish it in another. Switch effortlessly between viewports, views and visibility settings — simply set up panes and view them all at once. Instantly gauge the impact of a design change across 3D, plan, section and elevation views, and even start a rendering in one view while working in another. Direct section and elevation editing — Edit models directly from viewports: add openings, align and distribute windows, reposition doors across multiple layers, reshape walls — it’s all possible. Change the 3D views while in the section to see how edits simultaneously affect plans and model views. And, create better-looking, more-accurate drawings in a fraction of the time. Improved graphic output for architectural documents — Generate documentation from a BIM file much more efficiently. Improved graphic controls within section views of wall joins and wall, or slab and roof components provides the flexibility to quickly achieve high-quality documentation from a 3D model. Robust wall modeling options — Control individual component heights by instance, attach information to them, insert component caps and simultaneously edit multiple selected components from an easy-to-use dialog box. Plus, swiftly make wall graphic display changes with the new ability to switch all attributes by class. Easier title block customization — Customize items such as variables and orientation, choose from an unlimited set of information to include in a title block, and use styles to more simply manage many title blocks across one or multiple projects. 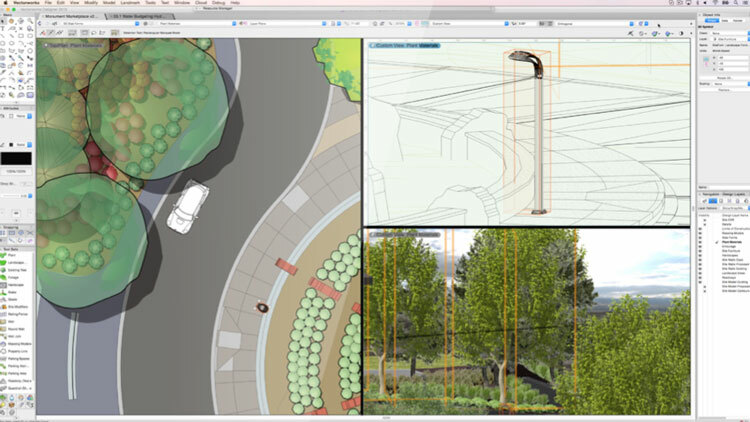 Streamlined drawing distribution — Publish drawings based on issue date and a tightly integrated new title block object; generate and distribute drawing sets, issue information and reports throughout the duration of a project; and automate the typically laborious process of creating a BIM project or lighting a stage. New zoom option for video and blended screens — It’s now easier than ever to manage the planning and visualization of video screens in designs. With new graphic output capabilities, more accurately understand, estimate and adjust available throw and zoom, to enable final equipment choices earlier in the design process. Enhanced seating section — Choose from additional layout methods, multiple seat numbering options and graphic controls to easily set and modify seating sections from the Object Info palette. Generate more precise seating layout visualizations for an event and automate seating schedules for inventory and ordering. Direct site model contour editing — Edit a site model easier than ever with improved site model settings and direct 2D contour editing. Modify each contour line as easily as editing a polyline. New import/export tree survey options — Generate existing site conditions from GIS and tree survey data without the need for external tools. Just use geolocated tree species data to create existing tree objects and export back to clients via Shapefile (SHP), TXT and DXF formats. As in past years, many updates to the software directly correlated with customer feedback. The English-language version of Vectorworks 2018 software is available by download for Vectorworks Service Select customers. To learn more about Vectorworks 2018, visit www.vectorworks.net/2018 or follow #Vectorworks2018 on Facebook, Twitter and Instagram.